There's no better time than the holidays to celebrate the joining of friends and families, & Allegro Coffee Porter joins two of the planet's best brewed beverages: a porter brewed with a bittersweet balance of malt and hops, and lightly-roasted Allegro® Celebration Caffee coffee brewed for sweet notes of butterscotch, toffee and chocolate. With hops and malt from the hopyards and barley fields of Rogue Farms in Oregon and coffee beans from Guatemala and Ethiopia, we think you'll consider this sweet, smooth porter a new seasonal favorite. 22oz bottle. The classic Rogue painted bottle but sold only at Whole Foods Markets. 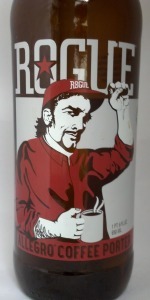 Label is similar to the dude on the Mocha Porter bottle, but with a different color scheme. Oh, and more ABVs inside. Beer pours very brown in color, deep, almost black. No head. Aroma is like opening a bag of dark roast ground coffee. Very roasty and earthy. And the flavor solidly delivers what the nose promises. Very much a full bodied porter, mouthfeel is even a little bit heavy. Brewed coffee serves as both a flavor and bittering agent. Enjoyable, even through the black coffee aftertaste. A: Dark brown with caramel hues. Cream-colored half inch head. Wispy lacing. S: Coffee beans seem to be of a lighter roast. very nuanced aromas of earthy and fruity beans with a kiss of smoke and sweet toffee. Caramel, toffee, and a pinch of cocoa from the malt. Orange zest from the hops. T: Taste follows. Hard to tell where the malts end and the beans begin. Lightly smokey, fruity, toffee, caramel, cocoa. Orange zest hop flavors pick up toward the back. Coffee beans are front and center on the finish with light smoke, roast, red fruit, and toffee. M: Body is on the lighter side of medium. Creamy and silky in texture. Carbonation scrubs briskly. Moderate astringency from hops and coffee. O: A very complex and nuanced coffee porter. It favors the connoisseur of fine coffee who can really appreciate the intricacies of the beans used. Color is a nice reddish woody shade, fairly clear but just about too dark to tell for sure. Aroma strikes initially as caramel hazelnut, cocoa, and medium roast coffee with fruity nuttiness. Smells and tastes like a light fluffy coffee porter. Fairly dry chocolate with high cocoa levels. Caramel integrated evenly throughout adding chewy texture. Carbonation is right where it should be. Clear auburn with a decent beige foamy head, dropping to a nice, permanent covering. Smells like fruity coffee, cocoa, and caramel malt. Flavor is mostly coffee roast as well with a little vanilla and honey backing it up. Fluffy carbonation and drying finish. Pretty tasty little coffee porter...the bright coffee doesn't taste overly stale and the solid porter base still comes through. 22 ounce bottle - $6.98 at Sherlock's in Kennesaw, Georgia. Appearance: Pours a very dark brown body beneath a medium-sized, light beige-colored head. Smell: Blended malty notes of darkened breadcrust, nutty caramel, melty milk chocolate, and, of course, the coffee beans with faint, faint hints of spice and fruit. I found it nice and inviting. Taste: Just as with the aroma, it's a pleasantly malty melange of chocolate, toasted bread, smooth caramel and upscale cola. Plus, the balanced coffee addition. Medium sweetness. Tiny pinch of malted milk. A light fruitiness of golden raisin. Modest hop flavors, lightly bitter. Malty finish, still with the coffee and a light, lingering sweetness. Mouthfeel: Medium-bodied. Carbonation is just a hair of medium. Overall: Getting through some of today's heavy, heavily flavored beers takes time and effort, people, and dammit, I don't have a lot of either. However, this was a joy to drink. Whaddya say, Rogue, can we toss Mocha Porter and replace it with this offering year-round? A: The beer is hazy amber brown in color and has a light amount of visible carbonation. It poured with a quarter finger high beige head that gradually died down, leaving some patches of bubbles on the surface and a collar around the edge of the glass. S: Light aromas of roasted coffee beans are present in the nose along with hints of toffee, the latter of which becomes more apparent as the beer warms. T: The taste is similar to the smell, except that there are stronger notes of roasted, nutty malts along with faint hints of cola and toffee. The hops contribute a light amount of bitterness. Faint amounts of butterscotch become perceptible once the beer warms up. M: It feels just about medium-bodied on the palate and has a moderate amount of carbonation. The roasted malts and coffee lend a little bit of dryness to the finish. O: The coffee in this beer isn't that bold or dominant, so predominantly tastes like an American Porter that has some infused coffee. You really need to let this beer warm up to let the coffee flavors develop. 22oz bottle, another coffee variant porter to build on (or compete with) the Mocha Porter, it would seem. This beer pours a somewhat hazy, dark orange-brick amber hue, with two skinny fingers of weakly puffy, thinly foamy, and mostly just bubbly beige head, which leaves some sloppy bleeding paint job lace around the glass as it slowly and evenly subsides. It smells of rich, lightly roasted coffee beans, bready caramel malt, hints of salted toffee, bittersweet powdered chocolate, a subtle nougat sweetness, sour milk, some mixed nuts, and soft earthy, leafy, and weedy hops. The taste is more well-creamed and sugared black, nutty coffee, a bit of charred woodiness, understated dark cocoa notes, grainy caramel malt, subdued biscuity toffee, a low-key earthy yeastiness, ethereal anise spice, and plain gritty, weedy hops. The carbonation is quite light and generally frothy in its bearing, the body kind of on the low-end of middleweight, and mostly smooth, the guest coffee not an overly invasive or acrid party goer. It finishes off-dry, just, the caramel and toffee essences trudging their way along, while the complex coffee-borne character hitches along for the ride. As usual, I must state that I am agnostic, leaning towards anti-coffee, depending on the situation at hand. Here, the particular java strain (?!) does well to mesh with the base malt, rendering a coffee porter that is somehow greater than the sum of its parts, if apprised separately. An agreeable brew, especially since an enticing Coffee Crisp nature seems to unfurl as it warms. Poured a dark brown body with one finger tan head and lace patches. Aroma is mostly roasted and coffee malts. Coffee taste is strong, like espresso strong, and there is a little bit of sugary/chocolaty sweetness in the beer but mostly it's coffee. Not a bad beer but the coffee flavor dominated beer and it didn't really appeal to me and it's just an ok beer. A: Pours a hazy just shy of opaque mahogany in color with light amounts of active visible carbonation slowly rising along the edges of the glass and moderate amounts of reddish brown highlights. The beer has a finger tall dense foamy dark tan head that slowly reduces to a very thick film covering the entire surface of the beer evenly with a thick ring at the edges of the glass. Moderate to significant amounts of lacing are observed. S: Light to moderate aromas of a lightly roasted coffee bean with some light aromas of toasted and caramel malts. Hints of cocoa. T: Upfront there is a moderate flavor of toasted and caramel malts with a hint of toffee sweetness and just the slightest note of roasted malts. That is followed by moderate to slightly stronger than moderate flavors lightly roasted coffee that gives a moderate amount of bitterness to the beer which lingers for quite a while. M: Just shy of medium bodied with moderate to heavy amounts of carbonation. Smooth. O: Kind of on the lighter side for a porter, not a rich with the roasted malt flavors aromas but that is somewhat made up for by the inclusion of the coffee. Very enjoyable and easy to drink though it does carry quite a bit of coffee-like bitterness. Painted 22 oz bottle on Christmas Day, 2016. Look: Beer pours dark brown in color, deep red-brown and almost opaque in the glass. Moderate size, fluffy and durable tan head. Aroma: dark roasted grains in balance with medium roast coffee. Flavor: delivers what the nose suggests, including a very well balanced mix of dark roasted grains and coffee flavors with a clear suggestion of dark chocolate. Mild bitterness. Feel: full bodied; creamy smooth; relatively lively carbonation. Overall: excellent, surprising even this Rogue fan. Very nice creamy and light retention tan head. A milky cream like appearance and quite light, with a very dark body color. Very deep and solid mahogany red, with a very nearly opaque appearance to go with it. Solid and big with a good look and some light ring lacing to match. Excellent aroma. Wonderful balance of piping warm coffee, milky creamy, some mild chocolate and a faint hint of hazelnut and vanilla like sweetness. Kind of hard to believe this is beer in front of me. All very nicely done with nothing overboard on the bouquet either. Palate comes very simply but real nicely. Light milky body but with some depth. Good matching husked like grains and char, with a simple roast quality. Lots of coffee bean and piping qualities in the mid palate. Big surprising finish with a steely grapefruit quality, and mild bitterness that matches with the coffee real nicely. The fruit angle just accentuates the coffee nicely, or is that the coffee fruitness bringing out the hop angle? Hits with grapefruit and even a melon cantaloupe quality. Very shocked at how good this is and how much I am enjoying it. Excellent brew. Appearance - Pours a dark auburn brown with a light tan finger width head. Fair retention results in a broken layer of surface suds and a fair ring around the edge of the glass. Virtually no lacing. Smell - Cold-pressed coffee with lesser notes of caramel and chocolate. Taste - Sweet upfront with strong notes of caramel and hints of toffee. Coffee flavors hit mid-taste along with faint notes of dark chocolate. Fair amounts of coffee roast bitterness in the finish along with hints of Rogue's signature pacman yeast character add up to a lightly fruity and bittersweet aftertaste. Mouthfeel - Medium bodied with a fair amount of carbonation. Smooth finish. Overall - Really nice balance and with a great flavor profile. The problem with coffee-infused brews is that they all taste good. It's a hard style to mess up, but perhaps even harder to make one stand out. This brew doesn't quite completely break away from the pack, but there are some distinguishing qualities that make this worthy to try. From what I understand, this one is exclusive to Whole Foods markets. Seek and destroy! Poured into a Reuben's Brew snifter. Pours a very dark brown, appearing opaque black in the glass with a fine, thin light brown head with good retention and lacing. Nice coffee aroma with toasted malt and chocolate. Flavor is semi-sweet dark malt, light toast, good coffee, cocoa. Finishes with semi-sweet mocha, somewhat like a Frappocino. Medium bodied with hints of creaminess. A nice coffee porter with top notch coffee flavor. This is a laid back porter with the toasted malt elements subsumed by the coffee and chocolate. Not sure if the base porter would be exciting, but this is nicely blended and balanced. Leaves pleasant coffee with mild hop bitterness as an aftertaste. 6.2% ABV per the label. Pours a murky dark orange-brown with a foamy khaki head that settles to a film on top of the beer. Thick rings of lace line the glass on the drink down. Smell is of dark roasted malt, cocoa powder, char, and stale brewed coffee aromas. Taste is much the same with cocoa powder, char, earth, and acrid coffee flavors on the finish. There is a medium amount of roast bitterness on the palate with each sip. This beer has a lower level of carbonation with a slightly crisp and medium bodied mouthfeel. Overall, this is an above average beer that is drinkable, but the coffee characteristics in this one are a bit stale and acrid to me. 22 ounce bottle into signature pint glass; no bottle dating, but is a recent release. Listed as 6.2% ABV on the bottle. Pours lightly hazy deep reddish brown color with a 2 finger fairly dense tan head with good retention, that reduces to a small cap that lingers. Light spotty soapy lacing clings down the glass. Aromas of big medium roasted coffee, milk chocolate, cocoa, caramel, toffee, toast, brown bread, nuttiness, light herbal, and roasted earthiness. Very nice aromas with good balance and complexity of coffee and dark/bready malt notes; with good strength. Taste of medium roasted coffee, milk chocolate, cocoa, caramel, toffee, toast, brown bread, nuttiness, light herbal, and roasted earthiness. Light herbal/roasted bitterness on the finish; with lingering notes of coffee, milk chocolate, cocoa, caramel, toffee, toast, brown bread, nuttiness, and roasted earthiness on the finish for a good bit. Damn nice robustness, complexity, and balance of coffee and dark/bready malt flavors; with a great roasted bitterness/sweetness balance and zero cloying flavors after the finish. Medium carbonation and body; with a very smooth, moderately creamy, and slightly bready/chalky mouthfeel that is nice. Alcohol is well hidden with minimal warming present after the finish. Overall this is an excellent coffee porter. All around great complexity, balance, and robustness of coffee and dark/bready malt flavors; and very smooth to drink. This is unique because there are no roasted malts according to the label; but the coffee provides plenty of roast/chocolate flavors that are very well balanced with the malts. A very enjoyable offering.